Is negative equity the ultimate legacy of feminism? A movement that began in Ireland as elsewhere desiring that women should be free to participate fully in society ended up fetishising paid employment over all other choices. And one consequence of this fetish has been the explosion of household debt now gripping hundreds of thousands of Irish families. I've charted the trend in total mortgage lending outstanding (from Central Bank data) against the participation rate of all married women (from the CSO). 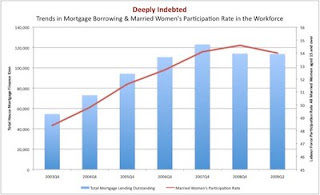 One consequence of the unprecedented and rapid increase in married women's participation in the workforce (passing the 50% mark in early 2005) was the ability of households to borrow money. Instead of borrowing against one income they could now borrow against two. And the banks, God bless 'em, were only too eager to lend. Way too eager as we all realise in hindsight. This rapid increase in women's participation in Ireland's workforce is addressed in yet another Equality Authority report on the plight of Irish women - A Woman's Place: Female Participation in the Irish Labour Market. Oddly enough, nowhere in its 102 pages does debt, borrowing or mortgages get mentioned. Instead we are treated to the usual bromides about pay gaps and unequal household divisions of work. All of which are, if you read the text carefully rather than the press coverage, almost entirely explainable in terms of the choices women - working or otherwise - have made for themselves (and with which the vast majority of women are happy). You might think then that the authors would propose leaving well enough alone. But of course not: what would the Equality Authority be left doing if that was the case? So instead we get the usual political shopping list of better pre-school provisions, more flexible employers and less selfish husbands (or partners as we say nowadays). They want to increase the participation rate of women in the workforce not because it's what women want (it's simply assumed) but "for Ireland to achieve and maintain the targets set for female employment within the EU" (last line of concluding text). Whose 'target'? The small matter of the economic depression now gripping the country is acknowledged by the authors. But not the debt binge that preceded it. They wonder if rising female unemployment might lead to a regression in female participation as women give up hope of getting work. But they shouldn't worry: the legacy of family indebtedness left behind by fetishing paid employment over all other choices a woman might make will ensure that hundreds of thousands of women will have no choice but to keep on working. Slaves to debt, and slaves to the consequences of a flawed ideology. Ssssshhh, don't tell the equality authority that a large portion of women are happy not working or working part-time, this does not compute with the out-dated, redundant philosophy of the feminist movement and the bien-pensant, red-brick liberals. This claptrap is tired and lacks intellectual rigour. You're in dangerous waters there Gerard. But I guess that's what telling the truth is all about. I foresee the next big battle will be about political reform in Ireland. Would be interested to hear your views on that. Why is female employment fetishised in your books and not male? In reality all employment is fetishised in the current 'productionist' paradigm held by leftwing and rightwing economic traditions alike. The problem is not women working but a money system that is based on debt secured against assets - usually property or to be more precise land. Even within the current flawed money system, the bubble and disasterous bust could have been prevented by prudential regulation of the banks and an annual land value tax. Another contributing factor to this issue is the individualisation of taxation (by Charlie McCreevy). This effectively penalises a woman who chooses to stay at home as that portion of a couples tax free allowance is lost. The net effect of this to discriminate against those on lower incomes (who would lose more) and to reduce choice for women by increasing the barriers to staying at home. Of course, exactly the same problem applied to men - so perhaps thats why the equality authority isn't interested! Of course, it is much better for the economy to have both parents working, leaving their (negative equity) house at 6am to commute an our or more to work, dragging their preschool children out of bed in the middle of the night, and paying someone else to mind them, and then pay tax on their child benefit... than to give a tax allowance to a parent to stay at home with them for a few years! I wouldn't say the whole ideology is flawed. Just because a woman is working doesn't mean she is forced to take out a 40-yr mortgage. That's another choice which some people made and hardly negates the benefits which feminism has brought to Ireland as a whole. The point of allowing women to work was to give people a choice and you can't say;'o, I don't like what you're doing with that money now, give it back. We only wanted you to spend your salary on university for your children not a holiday home in Bulgaria.' Personally I would blame the problem more on this fixation Irish people have with property-ownership. When are we going to realise that it's been over 160 years since the Famine and being a tenant is not a shameful thing? "the benefits which feminism has brought to Ireland as a whole"
And what are those, exactly? "being a tenant is not a shameful thing"
It's not a very good wealth-building thing, either. No. The ultimate legacy of feminism is that women have the rights and opportunities that allow them to fulfil their intellectual, creative, social and political potential. The ultimate legacy of feminism is that women can choose to lead a life outside the domestic sphere. The ultimate legacy of feminism is that women can choose economic independence over economic reliance on their husbands. The ultimate legacy of feminism is that women have a political voice. That's a hell of a legacy. Maybe some women do feel pressured to work. Maybe some men feel pressured to work. Our materialist society certainly values paid employment over other choices, for women and men, and I would love to see that change, so that no one is coerced into a life path that is wrong for them. But I know one thing for sure, I am glad I have the choice to work. I am glad I have the right. I am glad I have the opportunity. I feel the deepest gratitude to the feminists who fought so that I can have these things. It strikes me that you've written a post about feminism that is not about feminism at all. It's about money. And the achievements of the feminist movement can't be counted in euros and cents. 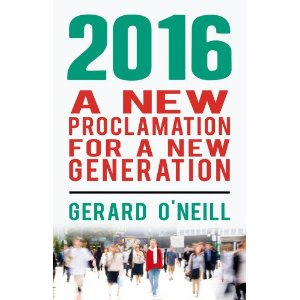 No Future for Trade Unions? Thank God It's ... Sunday?